With LDDJ Bluetooth FM Transmitter, you can safely and conveniently answer/ hang off/reject/redial calls with one button, and you can also rotate the button to adjust frequency or skip song tracks. Charging 2 devices simultaneously for phone, tablet and other rechargeable devices, convenient and high efficiency. With A2DP function, stream music from Bluetooth device to car's FM stereo system. Or you can plug the U disk or card reader with TF card(up to 32G) into the upper USB port to play the music. Charging and listening music simultaneously while driving. With noise cancellation (CVC) technology and A2DP function, the wireless fm transmitter provides most crystal sound quality. 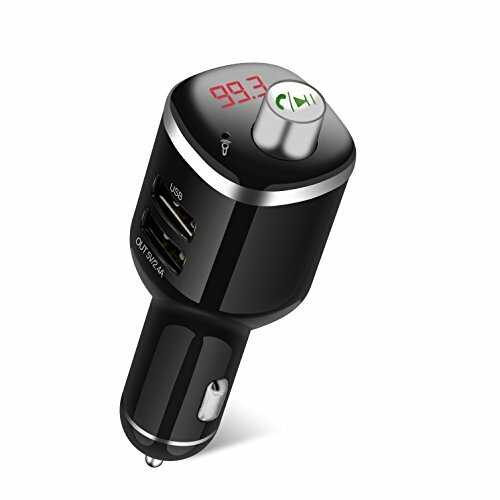 -The Bluetooth FM transmitter turns on automatically when plugged the integrated car charger into car cigarette lighter hole. -Select any of blank frequency between 87.5-108MHZ. -Turn on car FM stereo and select the frequency same as that of the device. Short press "CH" key to channel setting, at this time, the channel is flashing on LED display, then short rotate the multifunctional button to switch the channel from 87.5MHz to 108MHz. HANDS-FREE CALL: With Advanced Bluetooth4.2 technology and high-performance built-in Mic, LDDJ car FM transmitter enables car stereo to make and receive phone calls with one button, providing safety while driving. Easily switch the mic ends between phone and the FM transmitter by rotating the multifunctional button. DUAL USB CHARGING PORTS: Two devices can be charged simultaneously with dual USB port (5V/1.4A 5V/1A), convenient for both driver and passenger. The upper USB port can read U disks or card reader with TF card(up to 32G) to transmit and play the MP3 files automatically. When plugging in, the red light in USB ports will light up, convenient for inserting at night. EASY SET UP: 1)Plug the bluetooth FM transmitter into cigarette lighter socket; 2)Turn on your car radio and choose an empty channel; 3)Adjust the frequency of bluetooth transmitter as the same as car radio(87.5-108.0MHZ); 4)Connect your phone with it via bluetooth, then you can control you phone call or skip the song tracks freely. WIDE COMPATIBILITY: LDDJ wireless Bluetooth fm transmitter is compatible for iPhone 7 plus 7 6S 6 Plus iPad iPod, Android Samsung Galaxy S7, S6 edge, Blackberry, Sony, Nexus 5X 6P, Moto and other bluetooth enabled devices. WHAT'S MORE: Equipped with mini LED screen, the working voltage of the car battery can be showed by long pressing CH button; support A2DP; compact size; one multifunctional button; 12-month worry-free warranty and 24h all day friendly customer service. If you have any questions about this product by LDDJ, contact us by completing and submitting the form below. If you are looking for a specif part number, please include it with your message.